We fully support Vaadin' push support with current JVx *nightly* builds (see JVx with vaadin UI and server-side push). We had some problems with manual push mode because of some strange implementations of atmosphere in vaadin. We found a better solution to be independent of vaadin changes (should work with 7.1.8 and later). No we automatically push if you use standard threads or threads, created via VaadinFactory. It's also possible to use JVx' callback mechanism for push operations. If you won't use threads in your client application, simply make an async server call. The server implementation automatically starts a new thread and executes the task. The server will notify the client after the task is finished. This is a little bit strange because client and server run on the application server, if you use our vaadin UI. If your JVx client retrieves the result of an async call, it will automatically push the results to the vaadin client. This makes the whole application very smart and live. We didn't change JVx' APIs to support vaadin push. It works behind the scenes and we simply love it. Use our nightly builds to see how it works. We build all our OSS projects automatically every day, but only JVx binaries were available for download so far. We wanted to let you know that we added JVx.vaadin and JVx.help to the nightly-build download area. Check https://dev.sibvisions.com/jvx.nightly/ to get access to our nightly build binaries. Currently we only push JVx snapshot binaries to maven central, but we'll do the same with JVx.vaadin or online help in a few weeks. So keep reading this blog to get the latest news or follow us on Twitter. Vaadin supports "push" - since 7.1 - but JVx doesn't have an API for that. It's technology dependent and we usually not need it on client-side of an application. It would be useful for the server-side of JVx applications, but that's a different thing. I want to write about server-side push for UI changes. Create a new thread, through your factory and use invokeLater to update the UI. You always should use invokeLater to update the UI (no difference if you use swing or other desktop technologies). It's also possible to use vaadin push without JVx' mechanism (pure vaadin). To see how this works, read following issue: Server-side refresh. 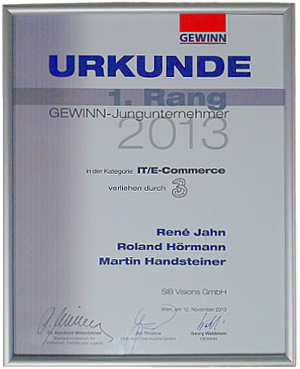 Wir sind seit gestern die Gewinner der Spezialategorie IT/E-Commerce des GEWINN Jungunternehmer Wettbewerbes - 2013. Wir konnten uns gegen eine sehr starke Konkurrenz durchsetzen und freuen uns dementsprechend über die Auszeichnung. 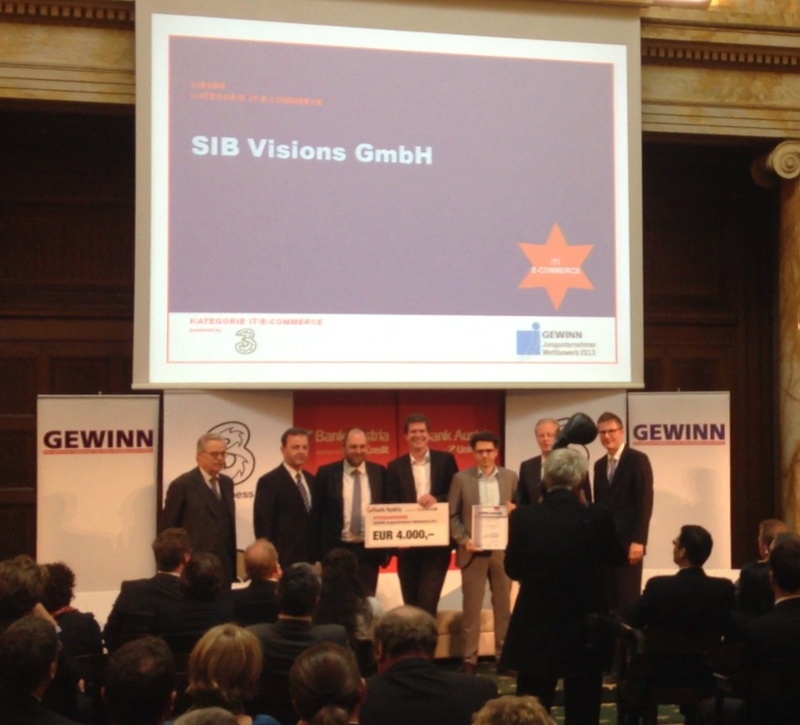 Zum Gewinn haben unser Produkt VisionX und unsere OpenSource Strategie beigetragen. Als eines der wenigen österreichischen Unternehmen entwickeln wir Technolgien für die Software Entwicklung. Durch die Auszeichnung wurden auch unsere konsequente Vorgehensweise und unsere hohen Qualitätsansprüche belohnt. Nicht zuletzt deswegen sind wir sehr stolz auf diesen Preis. In feierlichem Ambiente und mit gekonnt witziger Moderation wurde die Preisverleihung durchgeführt. We reduced everything to a bare minimum and it's now much better than before. We added missing information like usage with Maven, Nightly builds, repositories for our demo application. The demo application is now up-to-date. We replaced our showcase application with our new ERP demo application. We have a new JVx' video that shows all JVx features and projects like Online Help. Some month ago, we decided to create a new real-world application. And what's better for JVx as an ERP system? So we developed an ERP application It's not too feature-rich but demonstrates the full power of JVx. It's the first application that contains all projects around JVx. The application runs as Java Applet, Webstart (applet or application mode), HTML5 (based on vaadin 7.1), mobile REST server for mobile clients (native iOS and Android) and our rewritten Online Help. Oh, and the built-in JVx REST interface. The application is a multi-user application with a user/role management. The ERP system demonstrates a real-world Single Sourcing approach. A fat backend with a smart frontend and it supports mobility strategies. Thanks Stefan for your great work! The whole source code of the application is online and available on SourceForge. Feel free to send us your feedback! Our JVx First Application is now available on SourceForge. In the past, we only had zip archives that contained our first application. Now it should be easier for you to start with JVx if you don't use our maven archetype. The repository contains an Eclipse project that is ready-to use. The application itself is a database application. Please start the database before you start the application. The database is available and stored in db folder. Simply execute db/startHSqlDB.bat if you use Windows or start it manually on other OS'. Our First Application is a very simple JVx application and demonstrates first steps without complex use-cases. It simple demonstrates user authentication via XML security manager and CRUD operations with a database table. But the project also contains a JUnit Test that shows how you could test your business logic. A more complex application will be available in the next days. It's our Demo ERP. This application will demonstrate Swing UI, Vaadin UI, Online Help and more. It's a "real world" showcase that shows the full power of JVx.